"This is a wise choice by President-elect Obama. "Rahm knows Capitol Hill and has great political skills. He can be a tough partisan but also understands the need to work together. He is well-suited for the position of White House Chief of Staff. "I worked closely with him during the presidential debate negotiations which were completed in record time. When we hit a rough spot, he always looked for a path forward. I consider Rahm to be a friend and colleague. He's tough but fair. Honest, direct, and candid. These qualities will serve President-elect Obama well. "Rahm understands the challenges facing our nation and will, consistent with the agenda set by President-elect Obama, work to find common ground where it exists. I look forward to working with him in his new position and will continue to do everything I can to help find a pathway forward on the difficult problems facing our nation." Not sure whether one would really want Graham's endorsement (it's kinda like when McCain got Cheney's endorsement in the final days of the campaign, but with less dire consequences), but my point in including it is that Rahmbo's appointment to this post can be respected by both parties. There are those, of course, who feel this choice is a slap in the face of all of us who thought Obama would bring real change to the White House, starting off by picking a staff full of newbies and outsiders, apparently. John Kass over at the Trib points out that Emanuel is a Chicago Daley machine guy - hardly one to transcend politics as usual. 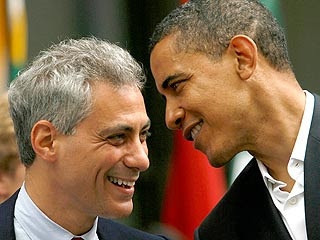 Here's what I think: Rahm Emanuel is Obama's personal confidant. He also has several important policy disagreements with Obama, and is extraordinarily blunt, making him ideal as an aide. He also really, truly knows how to get work done in Washington. He is in touch with Republicans and Democrats, and he makes things happen. Obama, a relative newbie to practical application of the process, needs someone who understands the logistics of the White House well. Emanuel is an outstanding choice. Next on the agenda - the Secretary of State appointment. Looks like it's down to New Mexico Governor Bill Richardson, former U.N. Ambassador Richard Holbrooke, and Massachusettes Senator John Kerry. No-brainer, says I: my vote is for Bill Richardson. I just want to hug him. Shouldn't you want to hug your SecState? We are political soulmates! I love Bill Richardson and I've been hoping for him for Secretary of State since the election started! The guy has more foreign policy experience than anyone in Washington (including McCain), he's level-headed, and he has great charisma and a fantastic sense of humor. He did make a little blunder once on the issue of gay marriage which he later blamed on "jet lag" but everyone makes a gaffe occiasionally (with the very notable exception of Obama!). I think he'd be a fantastic Secretary of State and I'm really hoping for this one! As a side note, I'd also like to see Colin Powell as Secretary of Defense. I'd really like to see him get a chance to redeem himself and show that without having to yield to morons like Rumsfeld and evil geniuses like Cheney that he could be a really effective and trusted military leader. And I love that he and Obama have the same calm temperment. haha I think we must be :-) The talk of Colin Powell as Secretary of... Education... seems a little odd to me. As a military member, Powell as SecDef would make me pretty happy. P.S. it was actually you, specifically, who helped me solidify my feelings on gay rights. In jr high/early high school I think I felt like most kids - mostly ambivalent - about politics in general. You know, if it doesn't affect me directly I'm not thinking about it. We were in church school one Wednesday night Freshman year (remember we sat in that big circle with freshmen and sophomores with that radio guy as our teacher), and we were talking about homosexuality, and you said something that has stayed with me ever since. It was this "I refuse to believe that two people can go to hell for LOVING each other!" and we all applauded. Profound for anyone, much less a 15 year old kid. I ended up fighting through college for gay rights on that very principle - no one should ever ever be hated or denied rights, and especially not for loving. I never properly thanked you for saying that simple thing that has strongly guided much of what I hold most important - human decency, love, basic human rights for all, etc... so thank you :-) I will repost this on your facebook in case you don't come back to look at follow-up comments here! And thank you! That's one of the nicest things anyone has ever said to me! I don't even remember that specific moment but I loved that class. Even though I disagreed with a lot in there, Ray Bower (the "radio guy" who is not on the city council) always allowed us to argue with him and to disagree and that was the first time in church school that I had seen that. I took sooooo much from being able to argue in that class. I remember you, Bridget Andrews, and myself often had the loudest disagreements and I always appreciate that. I think everyone wants to make a difference in some way and its always nice to know that one has even with one person (though I'm sure you would have arrived at those princibles without my comment)! As a matter of fact, it is, in no small part, thanks to you that I felt comfortable talking in that class. I had been at the Catholic school for the last few years and not in church school and didn't know most of the people there and was initially very shy about the whole thing. However, when I saw how comfortable and vocal you were and saw that everyone was accepting of that it made me also feel comfortable piping up with my two cents! Ok, upon proof-reading that, I see that I made a ton of mistakes! Should have read it before I published it! Nobody hold that against me!